DBL - Art - Design Inspiration: Good News! Quilt published! I have good news to share today. 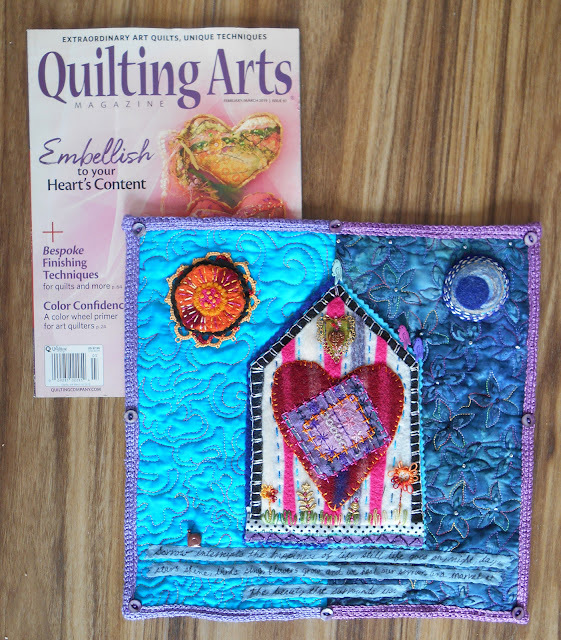 My "A Milagro Pondering" quilt which I made for the "Mended" Quilting Arts Reader Challenge has been published in the February/March 2019 issue of Quilting Arts Magazine. It was a great experience making this little quilt. The quilt is 12 in. x 12 in. in size. I made it back in August of last year, so I've known about the acceptance for a while, but have waited until the magazine came out to share it. The design for the quilt came to me when I read about the challenge. I named it "A Milagro Pondering" because it reminded me of "Milagro" charms. "Milagro" means miracle in Spanish. 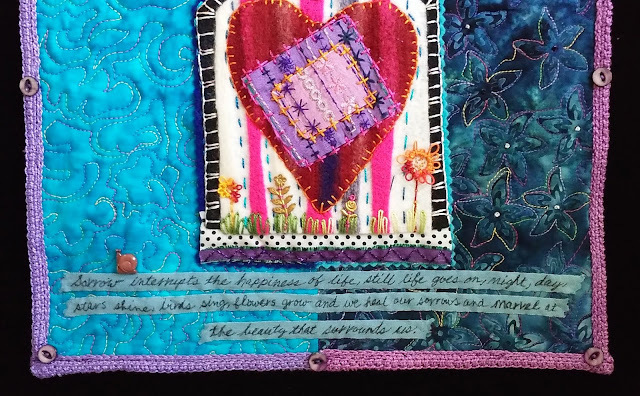 The text added to the little quilt popped into my head, too, while working on the quilt. Full view of quilt, I used machine quilting and stitching, hand embroidery, needle-felting, tatting, brass and button embellishments. The words on the ribbon say: "Sorrow interrupts the happiness of life, still life goes on, night, day, stars shine, birds sing, flowers grow and we heal our sorrows and marvel at the beauty that surrounds us". The little snail button was a gift many years ago from a dear friend. The binding on the quilt is Tunisian simple stitch. Close up view of quilt. 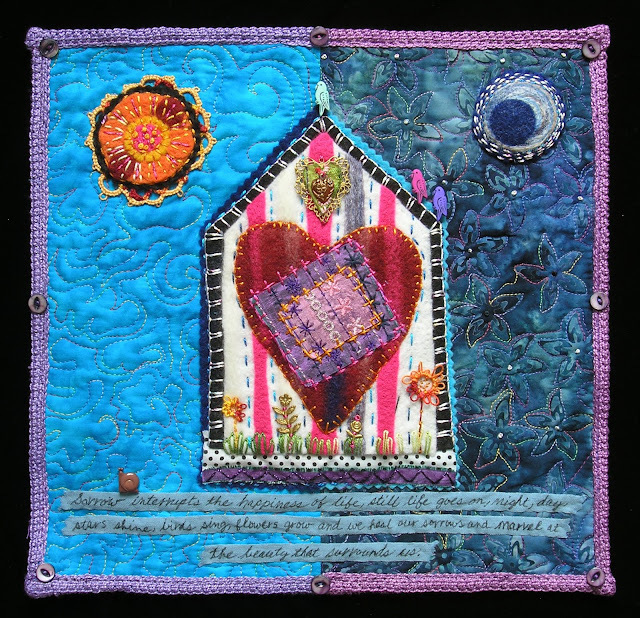 The silk embroidered patches in the center of the heart were leftover from another larger project. Quilting Arts Feb/March 2019 Issue in which my quilt is published. 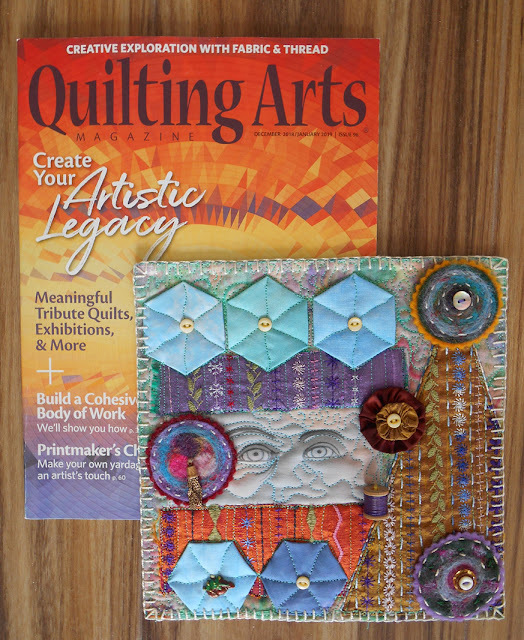 Dec 2018/Jan 2019 issue of Quilting Arts magazine. You can read more about it in earlier blog! 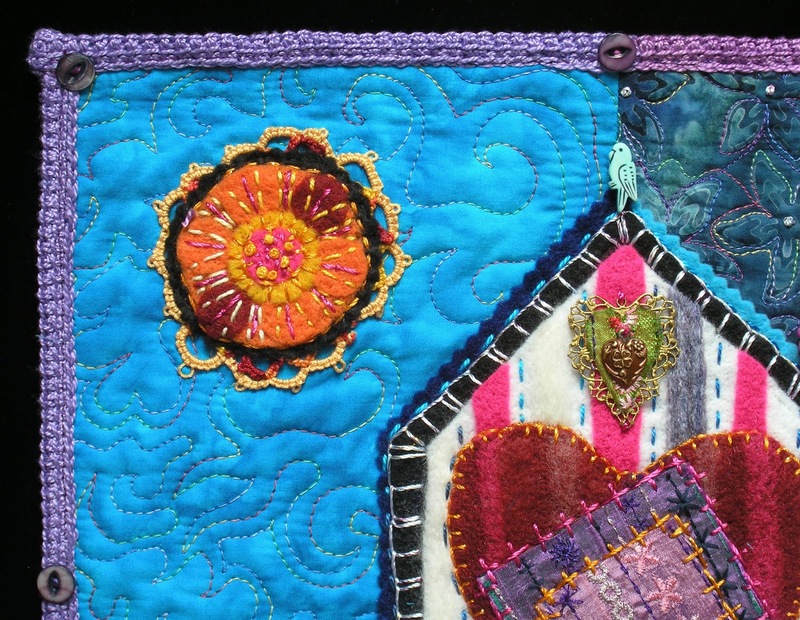 Hope you will check out Quilting Arts Magazine, and the other Reader Challenge entries. They are all inspiring, as is Quilting Arts Magazine!